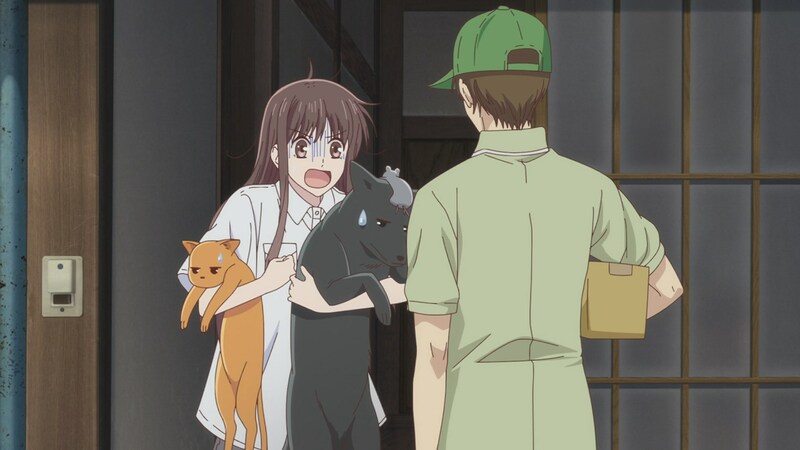 After Tohru accidentally causes Shigure, Yuki, and Kyo to transform into their animal forms, Shigure explains how they are possessed by the spirits of the Zodiac. They soon return to human form, where Yuki agrees to fight Kyo. Kyo is quickly defeated. 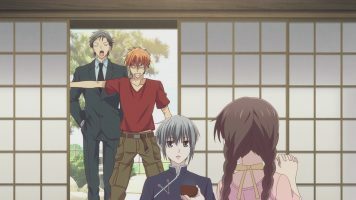 Yuki and Tohru go to school while Shigure goes to pay a visit to the head of the Sohma family, Akito. 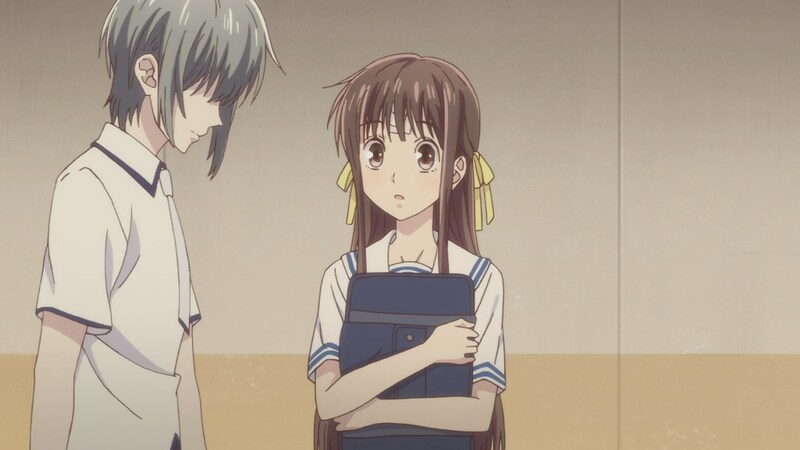 After school, Yuki asks Tohru if she’s given up the Sohma secret. He fears that her memories will be erased, explaining there had been an incident when he was a young child that required it. Tohru accidentally causes Yuki to transform into his rat form. She feels bad about it, but he forgives her. 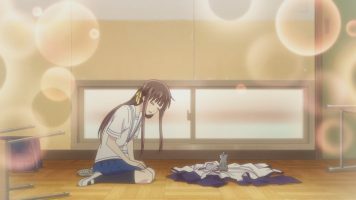 Yuki is stunned that Tohru is willing to accept having her memories wiped if it gives Yuki and the Sohma family some peace. Yuki recalls Akito telling him that any normal person would be sickened by Yuki turning into a rat. Tohru has no problem with it. As such, the two go home, where Tohru finds Kyo has patched the hole in the roof over her room. He makes an attempt at an apology, but Shigure’s arrival makes him cut it off. 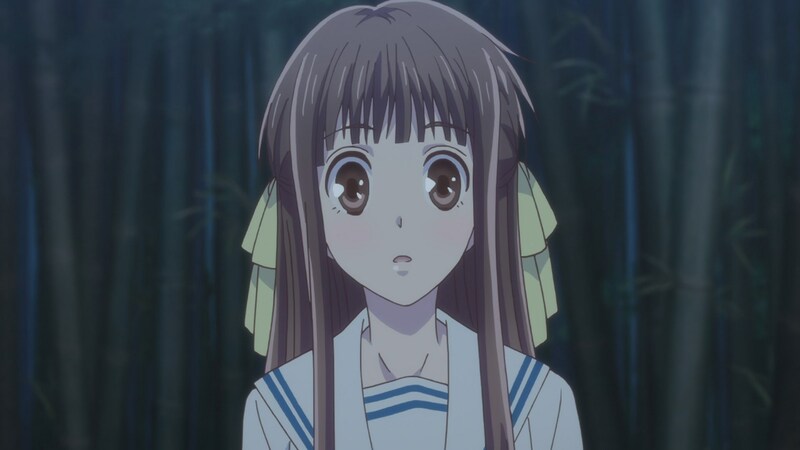 Shigure announces that Tohru can stay, providing she keeps the Sohma family secret. Sometime later, Tohru cleans up the filthy kitchen and cooks a meal for everyone. 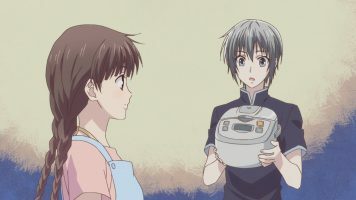 Shigure arrives with Kyo, who’s now going to be attending school with Yuki and Tohru. The school is abuzz when Kyo arrives. He panics over so many girls being there and flees. 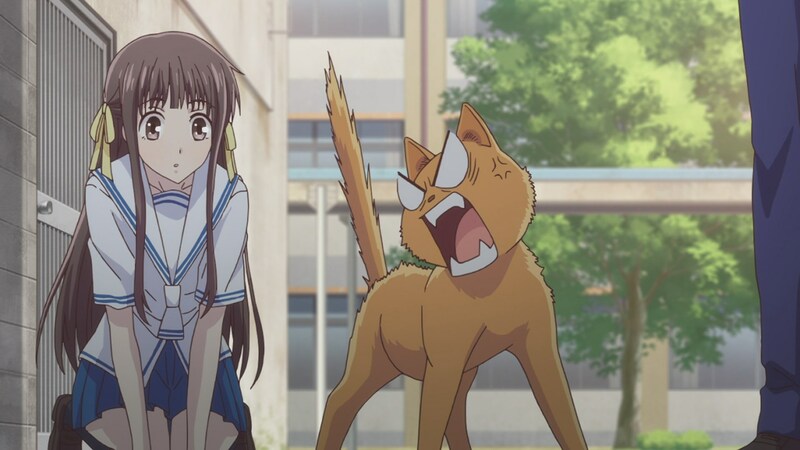 Yuki confronts him, but before they can fight, Tohru grabs Kyo and accidentally causes him to transform to the cat. 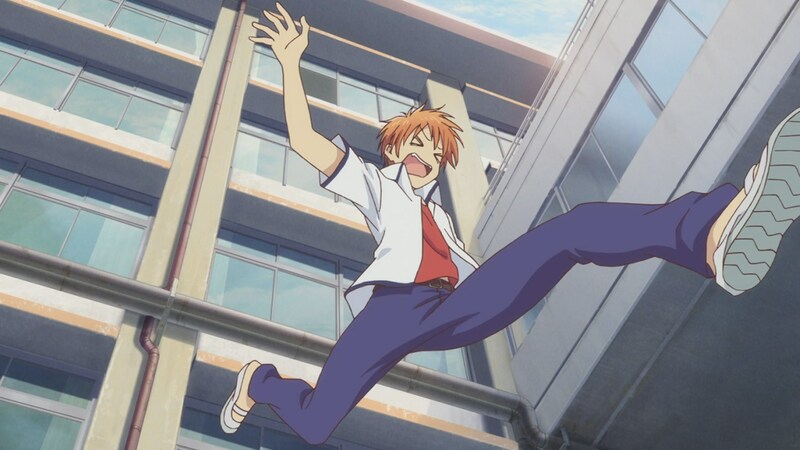 Kyo goes off on Tohru, causing her to leave all distressed. He returns to Shigure’s house, where they discuss his anger problems at the innocent Tohru. That night, Tohru walks to the Shigure residence after work. She’s determined not to let Kyo get her down. Kyo meets her on the path, though she initially mistakes him for a bad person and whacks him with her bag. They chat, where Kyo is surprised by Tohru’s love for the cat Zodiac. That night at dinner, he still ends up snapping at Tohru after being triggered by Yuki. 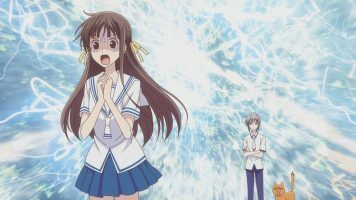 I thought I’d run down a list of things Fruits Basket (2019) 02 removed or modified from manga story. The food delivery is changed to a package delivery. No big deal there. Tohru’s dirty uniform element is gone. Actually, I don’t mind its loss. More on this later. Shigure informing Kyo that Akito has ordered he live at Shigure’s house is gone. 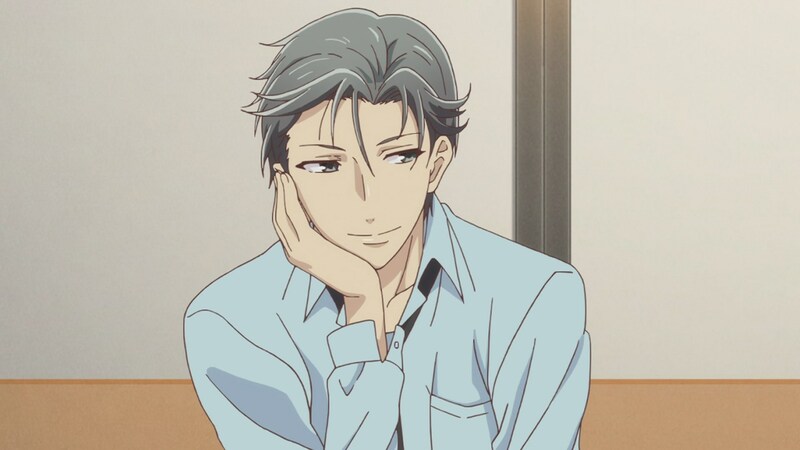 I suppose it was cut for time, but in the manga, this tiny moment does provide emphasis to Yuki’s concern that Shigure and Akito are plotting something. The aftermath of Kyo inflicting “Max Rage” on Tohru is removed. Nothing really is lost here in terms of story as it is about Uo-chan and Hana-chan finding Tohru and Tohru covering for why she had tears in her eyes. So nothing bad as far as removals go. Changes from the Manga: Improvements. Here’s a list of some changes that I felt were improvements over the source manga. 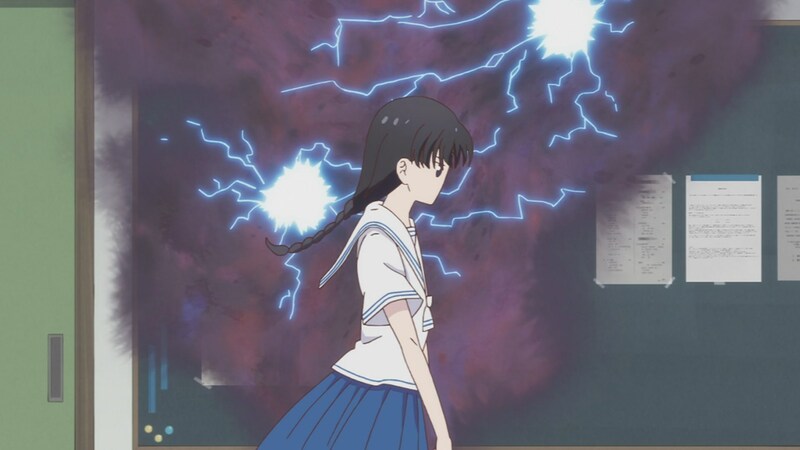 When Tohru accidentally caused Yuki to transform at school, I never realized school was where this took place. In all these years, I thought it was outside of school, since some panels had flowering plants and trees drawn in them. 😅 But checking against the manga, I see that this was just a stylistic choice by Takaya-sensei, not a literal thing. Yuki telling the story of what happened to him as a child is vastly improved over the manga. In the manga, Takaya-sensei simply told the story, violating the “show, don’t tell” rule of writing. The anime adaptation showed us the event as Yuki narrated, making the moment a better one. Kyo jumps out of a second floor window in the manga (or so the text reads). In the anime, he jumps out of a fourth floor window at school. This is an improvement because it really makes Kyo seem more like a freak to his classmates, especially since he survived the jump without issue. Overall, the changes were pretty positive for me in that they enhance the story or moments without changing it. 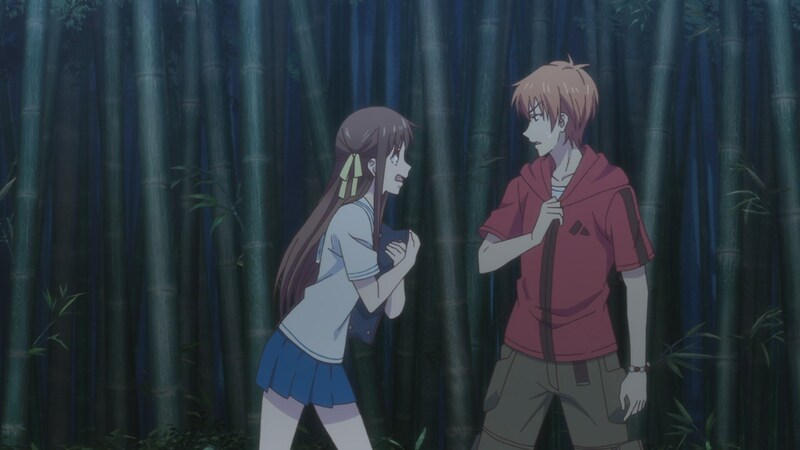 I have to say that watching Fruits Basket (2019) 02 was another blissful moment for yours truly. While there’s no such thing as a pure adaptation from one medium to another, I’m very glad that TMS decided to be so faithful to the source material. I decided to document the changes TMS does make simply because they are mostly making positive changes to the source material. The only negative change they made was so minor, it really didn’t matter (as I mentioned earlier). Plus, it is so lovely seeing the story come to life in color and animation! Of course, that doesn’t mean perfection. For example, Hana-chan loses her nose in one scene. 😅 But overall, everything works well in terms of art and animation. I will admit that while I’ve no problems with the new seiyuu voicing the characters, I do sometimes miss SEKI Tomokazu as Kyo. When Kyo went off on folks, Tomokazu just nailed those moments for me. UCHIDA Yuuma, Kyo’s new seiyuu, does a fine job, but doesn’t quite nail the rage moments the way Tomokazu did. But that’s a minor complaint on my part. It didn’t take away from the overall bliss I felt watching the episode. In the end, Fruits Basket (2019) 02 is more loveliness. I’m really glad Takaya-sensei allowed for this mulligan reboot series to be created. I’m also glad that TMS is so far doing a good job getting things right. One cour of anime is about five volumes of manga. So I expect this cour to end with the Kisa arc. Any word about how many episodes we’re going to get? I haven’t seen a total episode count. 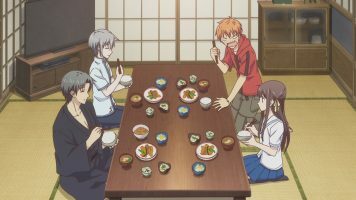 The Fruits Basket Omnibuses will be available at Comixology. They’ll be out on the 23rd.